When picking a stock to invest in there are two different types of research that you can do…or should I say…need to do. 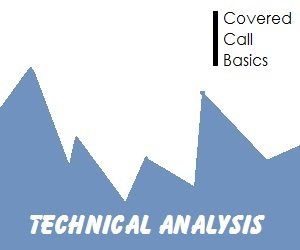 Fundamental analysis and technical analysis. Watch any financial news show long enough and I’m sure you’ll here both of these terms mentioned at least once. Here I will show you why if you’re putting any money in the stock market, you must do a technical analysis of that stock, even if you claim to just be a fundamental investor. Just because you can set your DVR to record your favorite TV shows doesn’t mean you’re an honorary member of the Geek Squad. That’s not the kind of tech we’re talking about here. In a nutshell, technical analysis is simply looking where a stock has traded in a given time frame to try to pick out trends and predict or forecast future prices. You can easily view a stock’s previous price history by checking it out on a stock chart. Now when we talk about predicting stock prices, I use the word predict very lightly. Technical analysis isn’t some hocus pocus that will magically tell you where the stock will trade tomorrow. 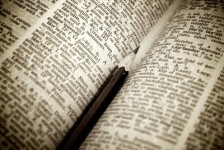 It is meant merely as a guide to where a stock has traded in it’s past. Put simply, you are trying to tell what price a stock might trade at, because it has traded near that range at some moment in the past. Every stock that is publicly traded can be viewed on a chart. The chart is simply a record of every price of the stock within the time frame you select. For example let’s say you want to look at where Apple (AAPL) has traded in the last two months. You would simply go to any website that offers the ability to view stock charts, such as FinViz.com or Yahoo Finance and enter in the symbol or ticker for Apple, which is AAPL. Then you would want to change the current time frame that you are looking at to a ‘two month’ view. Use the + and – buttons at the bottom to zoom in/out. This will adjust how many months you see. Depending on which site you are viewing the chart on, you may be able to change the time frame you’re viewing from months, days and even years. Usually the time frames that you will have to choose from are one, three, six or nine month intervals. You will also see one to 10 year time frames as well. Not that you would need to see it for placing a covered call position, but stock charts also give you the ability to view just the last few days of trading. Lots of sites have the option to zoom in or out to extend or decrease a time frame if you wanted to view a period that wasn’t one of the pre-selections on the chart. Now that you’re looking at a chart for your potential covered call position, what do you do next? When you are first starting out, looking at a stock chart for any company can seem like looking at a jigsaw puzzle without any of the pieces put together. Don’t let it overwhelm you. When I first started learning about charts I felt like there was some secret message that only someone who worked on Wall Street could understand. I worried if I was looking at the right time frame. Should I be looking at a one year chart or a six month chart? What you first want to look at is where the stock is trading right now. 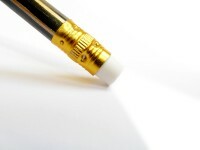 I know that may seem obvious but without a definite starting point it is easy to get discouraged by the mountain of information that you are viewing. It doesn’t matter if the market has closed for the day or if trading is still in session. 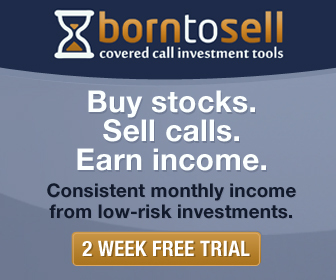 The current stock price will be your first point of reference as you begin to do your technical analysis. Next, you’ll want to look at the highest price the stock has traded at for the time frame you are viewing. If you’re looking at a nine month chart of Netflix (NFLX) then you need to look for the highest point on the chart. It doesn’t matter if you’re using a line chart, bar chart or candlestick chart to view your stock. What type of chart to use is a totally different discussion. After you’ve figured out the highest price of the stock for the time period, you ‘ll want to find the lowest price the stock has ever reached. Keep in mind that the current price of the stock could be either the highest price or the lowest price. You’ve heard the saying when buying stocks you want to ‘buy low and sell high’. How on earth would you ever know when the stock is ‘low’ or ‘high’ without looking at the chart? A broker’s recommendation? I am of the persuasion that I know what’s best for my money. I hope you share the same sentiment. The Trend Could Be Your Friend. There is a saying that is common among the investing community, particularly when it comes to chart reading. ‘The trend is your friend’. What they are referring to is the current direction or trend of a stock. I say current trend because you can find many trends within one stock chart. When it comes to trends there are really only three main directions a stock can be moving. It will either be in an upward trend, a downward trend or trending sideways. The thing about technical analysis is that it’s more of an art than a science. There’s no exact set of rules to use when trying to find a trend. Oftentimes you may disagree with someone else’s trend observation. You may think the stock is trending upwards while someone else thinks it’s really just going sideways. So how do you go about figuring out the trend? 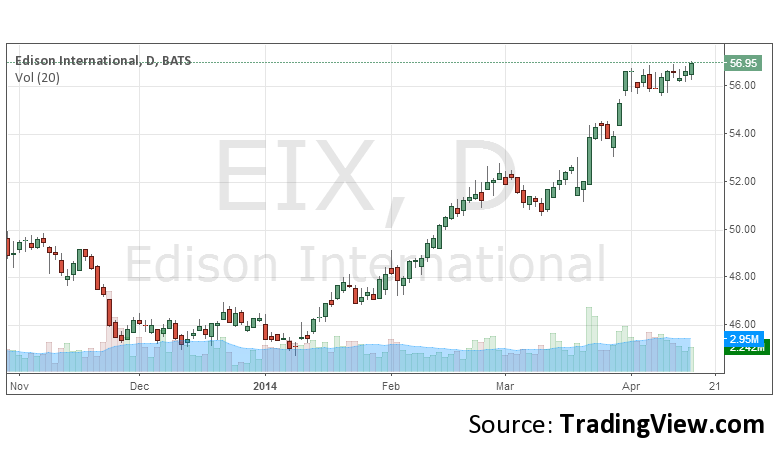 As you can see Edison International (EIX) is currently trading at $56.95 at the time this screenshot was taken. If we follow our steps for determining the high and low of this time frame, you’ll notice that EIX is trading at it’s high. The low is somewhere in the $45 range. So the big question is what is the trend for this stock and more importantly how do you figure that out? The definition for an upward trend is when a stock makes higher highs and higher lows. Say what? Yes, it’s a little confusing but let me explain it this way. As a stock trades, the prices are continually changing. Sometimes up and sometimes trading down. All of the high points can be seen on the chart as ‘peaks’. The low price range on this chart is similar to a valley. Think of it as if you’re looking at a mountain range. All of the peaks are the ‘high points’ and the ‘valley’s are the lows. Are You Looking At the Right High? The points where a stock ‘peaks’ in price is immediately followed by a dip in price. You won’t know the peak until the stock has traded down a bit it price. If you’re looking at a stock and it’s currently at it’s highest point on the chart, then you really don’t have a peak or high yet. The reason is that the next day, minute or hour the stock could continue to go higher. 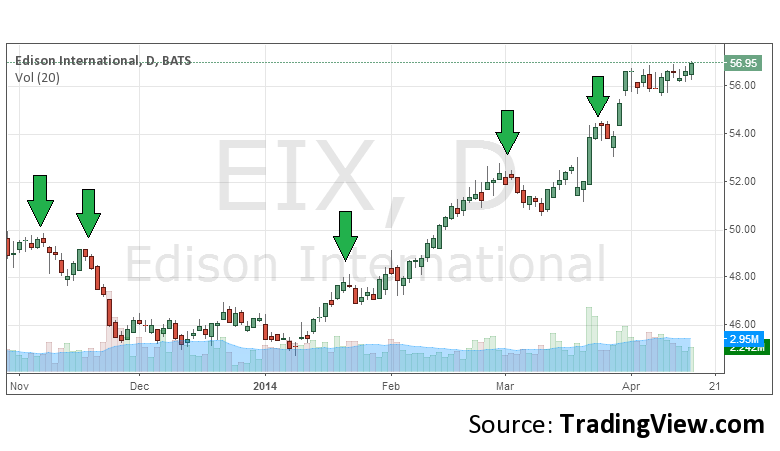 Let’s look again at the same chart of EIX and pick out the highs. The green arrows indicate the points at which EIX created a ‘high’. You can tell that point is a high because the stock price decreases soon after the high is made. On the other hand you can tell when a low is made because soon after the stock rises in price. The part of figuring out the trend is where it can get tricky. It’s best if you don’t try and make it too complicated. At a glance you could argue that this stock is on an upward trend. Looking at the last three green arrows you see that the next one is a little higher in price than the one before it. This is what is meant by making higher highs. Since the first two arrows are not trending higher one could argue that the stock is not entirely in an uptrend. An accurate observation would be that it was in a very short downtrend at the beginning that was following by a period of trending sideways. Not until the latter end of the chart did the stock start trending up. In conclusion, before you place a covered call trade or any position that involves a stock, you first need to analyze the direction or trend of the stock. If you are looking for a stock to go up and it’s trending downward, it may be time to find another stock…or at least wait until the trend is on your side again. Here’s what’s next. Take a look at two of the stocks in your portfolio and determine the trend over the last six months. Haven’t purchased any stocks yet? Pick two companies that you know of and check their charts to determine the current trend. I’d love to hear what you find.